Once you have logged into Batterii you can easily install your Web Clipper. The Web Clipper is an installation into your browser (browser extension) which was key to simplifying the installation and usability of the tool. Click on your name in the top right corner and select “Get Batterii Web Clipper” from the drop down. The pop up will ask you to add the extension to your browser. Click “Add” and your Web Clipper is ready to you. Browser installation automatically launched and then the clipper will be available in the top of your browser. This will install in the show as a small black button with blue dots. Depending on your Firefox Security settings it may ask you to click "Install Now"
Successful Installation Message will let you know your Web Clipper is now there and ready to you. When ready to use click the small black box with blue dots that show in your extension area of the browser. Safari will request that you download the browser extension file and then launch it for quick installation. Go to the downloads section in Safari (arrow in the top right corner) and double click on the clipper.safariextz. 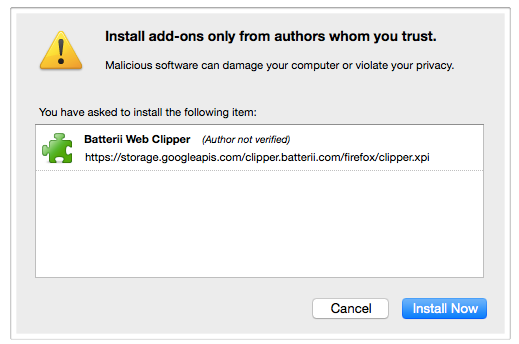 Safari will also ask you to confirm you want to Install the "Batterii Web Clipper", click "Install". The clipper button will show next to your browser search box. Your WebClipper has now been installed and it is ready to go! We apologize for the inconvenience but Web Clipper for Internet Explorer is currently not supported. We recommend using an alternative browser if it is available.